← Do Stocks Outperform Treasury Bills? Sergio Marchionne often raises eyebrows. This time, the Fiat Chrysler CEO went a step further than usual by declaring that the latest plan for the company is essentially a one-way bet on cheap gas. 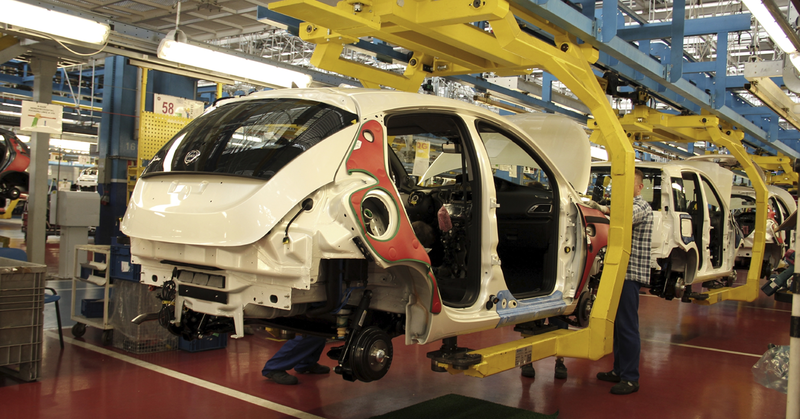 Production of compact cars will end to free up production capacity for high-margin, low-mileage Jeeps and RAM trucks. This, combined with Fiat’s more or less complete lack of a fuel economy or electrification strategy beyond buying emissions credits from other manufacturers “foolish” enough to produce electric and hybrid “compliance cars,” is quickly making Marchionne, if not an industry joke, then certainly yesterday’s man. At least, that is what people are saying. I have an alternate hypothesis. The Auto Industry Is Not Heading to a Good Place (The author, in my opinion, has the correct thesis. Ride sharing, Uber, Tesla, more complex electronics mean less demand and more investment to run in place). 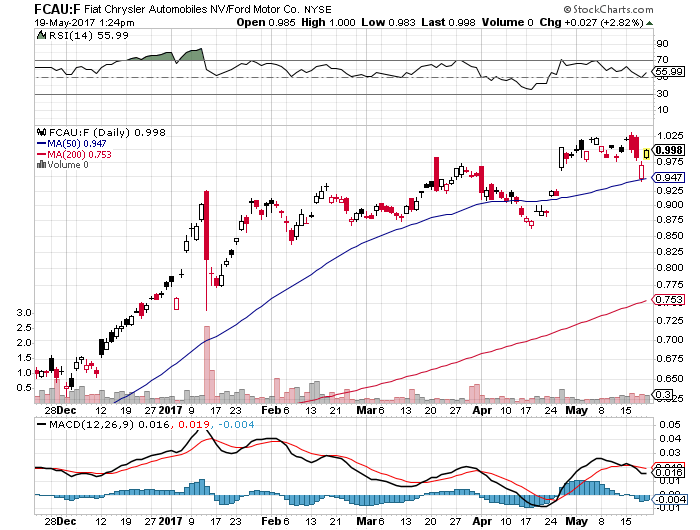 Fiat (FCAU) has done slightly better than GM and much better than Ford (F). However, the auto industry is in a bad place that will worsen. The context is frightening. Global fuel economy and emissions regulations are becoming so strict that it is possible to meet them only with partial or full electrification of the automobile. And the existing automobile production system, based primarily on stamping sheet metal and amortizing heartbreaking development costs and capital expenditures over millions of units, is incredibly capital inefficient. What’s more, the industry’s move towards electric vehicles represents a significant challenge to the traditional strategic landscape an automaker faces. An electric vehicle has drastically fewer moving parts than an internal combustion vehicle and is, by design, far more modular, meaning that barriers to new entrants are significantly lower. Electric vehicles are also far more uniform in their driving dynamics, because there is little scope for refining an electric motor with one moving part. Swathes of engineering and marketing investments become irrelevant. And both ride-sharing enterprises and developments in automation seem increasingly likely to grow beyond niche markets into something properly disruptive to the car ownership business model. Last year, Marchionne presented a uniquely critical slide deck about the way the auto industry destroys capital. His argument was that, unless the industry consolidates and stops duplicating engineering costs (e.g., every car manufacturer has its own separately developed but fundamentally identical 2.0L 4-cylinder petrol engine), then the market will eventually force its hand, having gotten sick of miserly returns on billions in investments. GM is not only merging with itself, it is also “disrupting” itself — as evidenced by their recently announced Chevy Bolt long-range, affordable electric car. The company claimed the Bolt was designed to be the perfect car for ride-sharing apps. Just before launching the Bolt, GM announced a $500 million investment into Lyft, the main competitor to Uber. In fact, the bosses of Daimler, BMW, and Audi went looking behind the couch for some spare change to buy joint ownership of Nokia’s (remember them?) mapping service HERE, and did so primarily to stop their rival bidder – Uber – from buying it. High-resolution maps are crucial to autonomous cars; Uber’s CEO has said that, if Tesla can make good on their promise of a long-range, autonomous electric car, he would buy “all” of them. The Germans are thus investing billions into electric vehicles made out of carbon fiber that pilot themselves using super-high resolution maps, all the while fighting back against Apple and Google’s requests for access to their cars’ infotainment systems. Their global leadership of the auto industry will have to be pried from their cold, dead hands. Meanwhile, all the difficult bits of the Chevy Bolt (“custom-built” for Lyft, remember) are built in large part by Korea’s LG. One wonders why Lyft (or Uber) would not simply buy the next model directly from LG? I guess even if there is no Foxconn for cars yet, there may be soon. Remember, electric cars are far more modular than internal combustion cars. Or, if not him, then certainly the Agnelli family. A sort of Italian royalty who control Fiat Chrysler (and Marchionne) via their ownership of the Exor holding company, the Agnellis have been showing signs that they are tiring of the endless drama surrounding Fiat and the auto industry in general. They bought a stake in The Economist in 2015 in a move towards media, but the recent de-conglomeration of Fiat has been noticeable in other ways. First, in 2013, Fiat’s industrial division was de-merged and combined with CNH Global (maker of tractors under the Case IH and New Holland brands) into a separate company, CNH Industrial. Most recently, Ferrari, the jewel in the Fiat Chrysler stable of brands, was floated in New York. Speaking of Ferrari, Marchionne took advantage of a recent dip in the fortunes of Ferrari’s eponymous Formula 1 team to unceremoniously eject Luca di Montezemolo as president and chairman of Ferrari and replace him with . . . himself. It should be noted that di Montezemolo was appointed by Gianni Agnelli himself after the death of the founder, Enzo Ferrari, and is a bona fide business superstar in Italy. Marchionne has been playing an increasingly active part in the politics of Formula 1 recently, something that will no doubt continue to make for a less stressful (but still stimulating) retirement when Marchionne puts on his famous blue sweater for the last time in 2018. But for now, Marchionne has seen the future. Large subcontractors will produce partially or fully autonomous electric vehicles, with the sole differences between them being brand value and design. The car makers that survive may well simply produce cars for Google (Ford recently signed an agreement along these lines), Apple, or Uber. Some, like BMW or Mercedes-Benz, may survive because of their brand and design qualities. Fiat Chrysler does not have this. Sell the profitable Jeep/RAM brands to another conglomerate that does not compete in these segments (for example, Hyundai KIA). Sell the unprofitable Fiat to anyone who will take it. Perhaps synergies in the lucrative European light commercial vehicle segment will attract another European maker, such as PSA Peugeot Citroën, whose CEO, Carlos Tavares, has ambitions that were thwarted at his previous employer, Renault. Sell Alfa Romeo and Maserati to someone who could use a strong brand. Perhaps Volkswagen will finally get hold of its prized Italian trophy if they can sort out their global legal woes. Retire to play with his giant Formula 1 Scalextric set. Marchionne has been mocked for his firms’ strategy, which has been attributed to hubris. But perhaps he is the one seeing clearest of all. Is the best way to deal with disruption simply to step out of the way? Question: Who wins when–in a perfectly competitive market–competitors fight each other? Prize awarded for best answer. This entry was posted in Competitive Analysis, Economics & Politics. Bookmark the permalink. The customer wins because of lower prices as the competitors continue to fight..
Interesting….I agree that the consumer wins, but investors in the industry get hammered. Just like going to war—no one wins but the arms’ manufacturers. The customer probably wins. Definitely the customer will win in terms of price. However, competition could also limit the ability of companies to compete on differentiation. That means that customers with more particular tastes might have something to lose too. e.g. if it’s so cheap that owning a car is luxury, then a normal person might not be able to afford an SUV or a Convertible. Suppliers might also win. If volume increases for cheap commodity products with high fixed costs, the operating leverage could be beneficial. Substitute products might be hurt. If it becomes incredibly cheap and convenient to transport yourself across the country by car, then why would you take a plane? Why take a subway if the car is cheaper and faster. Munger and Buffett’s comments about commodity businesses, in his case textile manufacturers is apt. Paraphrasing here, the savings on new machinery to make textile makers more efficient goes to the consumer. Nothing sticks to the ribs of the textile maker, and its owners are doomed by capitalism to suboptimal returns unless a knight in shining armor, like Buffett, foolishly rescues them. Presumably the machinery maker, if its products are differentiated enough will make money. The most efficient wins in a perfectly competitive market. The consumer will most probably win. But also a third party. With cheaper and more competitive products, a third party who packages it in a better way might get up on top. Especially if they can use it to complement their full brand lineup. E.g. iTunes vs music industry, Amazon vs retail. Direct consumers are not very likely to benefit a lot from near-perfect intra-industry competition — most markets are subject to “economies of scale”. The economy as a whole may win because resources will be used in their most efficient way. Perhaps the consumer is not the immediate winner because in a perfectly competitive environment there is no place for trade unions or protection of workers. The worker is ultimately the consumer too so what they gain in lower price they may lose in their terms at work. Everyone will be under more pressure but at least resources are not wasted. Hence, the economy at large is arguably the real winner. Many divergent views. I came from an investor’s perspective while others looked at the consumer’s point of view. Thanks for the comments. John, thanks for the post and the presentation – quite a different view. I think it is best for investors to view Fiat as a cashcow and milk it as much as possible. In some ways, it is better to not allocate capital to disruption incase the team doesnt have the nerve or the ability to tap into it. Better to return the capital. Maybe that’s what Marchionne is doing? Bonds might win. Vehicles are a large part of CPI. Perfect competition drives down prices, pushing inflation lower. Decreased demand for oil drives oil prices lower, pushing inflation lower again. Economy as whole might strengthen if consumers use savings to spend more on other things. However it also might weaken from job losses at the auto manufacturers (big employers). I don’t think the traditional suppliers are obvious winners, as traditional supply chains will be disrupted and manufacturers will put pressure on suppliers to lower their prices as well. I’m very curious as to the effects on the dealers. Possibly the new car dealerships (Autozone, Penske Auto Group, etc) benefit while used (CarMax, America’s Car Mart) suffer? Possibly all suffer as extra inventory comes on market? Possibly all do well because of low prices and increased customer demand?